What is Gallbladder & Biliary Tract Cancer? Gallbladder cancer is a rare cancer where malignant cancer cells form in the tissues of the gallbladder. Biliary tract cancer (also known as cholangiocarcinoma) is cancer that occurs in the bile ducts (tubes that transport bile from the liver). Gallbladder cancer affects the gallbladder, a small pear-shaped organ located in your upper abdomen next to the liver. The role of the gallbladder is to store fluid called bile. The liver produces bile to help digest and absorb fats in the small bowel (or small intestine). There are several types of gallbladder cancers, named after the type of cell it affects. Gallbladder cancer begins in the mucosal inner layer of the gallbladder and spreads through the outer layers. More than 85% of gallbladder cancer types are adenocarcinomas that start in the gland cells lining the gall bladder. The role of the gland cells is to produce mucous, a thick fluid that coats the lining of the gallbladder tissue. There are three types of adenocarcinomas: Non-papillary adenocarcinomas (75% of adenocarcinomas), papillary adenocarcinomas and mucinous adenocarcinomas. Uncommon gallbladder cancer types include squamous cell carcinomas, which make up only 0.5 to 3% of cases. Other less common gallbladder cancer types include sarcomas or lymphomas of the gall bladder. Biliary tract cancer is a rare cancer that affects the bile tract. The bile tract is made up of tubes that transport the bile produced by the liver into the small intestine. There are two bile ducts that come from the liver and one from the gallbladder.  These tubes connect to form the common bile duct that connects to the small intestine. When food is being digested, bile stored in the gall bladder is released and passed through the bile ducts into the small intestine. Biliary tract cancer can form anywhere along the bile ducts and each sub-type of biliary tract cancer is named after the location where the primary cancer begins. Intrahepatic cancers begin inside the bile duct in the liver. Extrahepatic cancers begin from bile ducts outside the liver. Half of bile duct cancers are Klatskin tumours, which form where the right hepatic duct joins with the left hepatic duct in the liver. Cancers that begin in the common bile duct are called common bile duct cancers. If there are multiple tumours present in different areas of the bile duct this is called multifocal bile duct cancer. The early stages of gallbladder or biliary tract cancer do not cause symptoms and diagnosis occurs mostly when the cancer is at a more advanced stage. Gallbladder cancer is a rare cancer in Australia and often only discovered during surgery to remove the gallbladder. Biliary tract cancer is also rare in Australia. 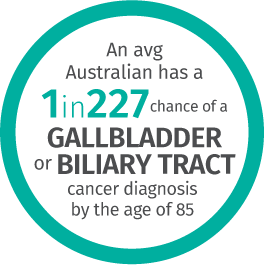 In Australia, around 931 people will be diagnosed with either gallbladder or biliary tract cancer in 2018. The average rate of incidence for Australians is 3 out of every 100,000 people. For people diagnosed with gallbladder or biliary tract cancer, there is a 19.7 chance that they will be alive 5 years later. Gallbladder and biliary tract cancer are extremely rare cancers in Australia. History of first degree or immediate relative (that is, mother, father, sibling or child) having gallbladder cancer can increase the risk five-fold but given that gallbladder cancer is extremely rare, the risk is small. History of taking hormone replacement therapy. Early diagnosis of gallbladder and biliary tract cancer is difficult due to the lack of symptoms in the early stages of the disease. In addition, the location of the gallbladder organ behind the liver increases the difficulty of early detection. The type of medical tests will vary depending on the symptoms. Tests examine both the gallbladder and bile duct to help diagnose possible disease. The medical practitioner will conduct a physical examination of areas, such as the abdomen, to check for swelling or lumps. Depending on the results, a blood test may be conducted as high levels of certain chemicals may indicate gallbladder or bile duct disease. This includes Carcinoembryonic antigen (CEA) and CA 19-9, which are both chemicals released by normal and cancerous cells. An abnormally high level of either can indicate gallbladder cancer or other diseases. The medical practitioner may also use ultrasound, Magnetic Resonance Imaging (MRI) or computed tomography (CT) scans to examine the internal organs in more detail, to see if cancer is present in the gallbladder, bile ducts or surrounding tissues. This will also help determine the size and location of the cancer and whether it has spread. A surgical procedure called a laparoscopy may also be performed to look for signs of disease in the abdomen. Small cuts are made in the abdomen wall and a laparoscope, which is a thin tube, is inserted in one of the cuts to examine the organs inside the abdomen. Other tests include a Percutaneous Transhepatic Cholangiography (PTC) or Endoscopic Retrograde Cholangiopancreatography (ERCP). Both procedures are x-rays that create an image of the bile duct – the part of the gallbladder that transports the bile from the liver to gallbladder and then to the small intestine. This can show whether there are any blockages or abnormalities caused by gallbladder cancer. If there is a blockage, efforts can be made to unblock it. During the procedure, the doctor may also take a small sample of tissue called a biopsy, for examination under a microscope to see if there are any cancer cells. The tissue sample may also be tested for CEA and CA 19-9 levels, which may indicate the presence of tumour cells. The most common treatment options for gallbladder and biliary tract cancer are surgery, radiation or chemotherapy. For gallbladder cancer, surgery called a cholecystectomy may be performed to remove cancerous areas. This surgical procedure removes the gallbladder and surrounding body tissue. In some cases part of the liver will be removed. Chemotherapy and radiotherapy may be given after surgery to kill any cancer cells. For biliary tract cancer, if the cancer is confined to the bile ducts, the best treatment is to remove all the cancer through surgery. The type of surgery depends on the location and size of the tumours. This includes removal of the entire bile duct if the tumour is small and has not spread. New bile ducts are then made by connecting the bile duct opening from the liver directly to the small intestine. In some cases, another form of surgery, called the Whipple procedure, may be appropriate. During the Whipple procedure the head of the pancreas, part of the stomach, small intestine and bile duct are removed. Chemotherapy and radiotherapy may be given after surgery to kill any cancer cells. If the gallbladder or biliary tract cancer has spread and is in the advanced stages, surgery may no longer be possible. If the tumour is blocking the bile duct, surgery or other procedures may be performed to ease symptoms and prevent build-up of bile. This includes placing a stent, which is a small flexible tube that allows the bile from the liver to be transported more easily into the intestine. Ways to lower your risk of gallbladder or biliary tract cancer include maintaining a healthy weight by being active and having a healthy diet. Having gallstones is also a common risk factor of gallbladder or biliary tract cancer, and thus removing the gallbladder may reduce the risk. However, gallbladder removal is not recommended unless the gallstones are causing health issues.